The results of the Sixth Industrial Fluid Properties Simulation Challenge were announced at a special session at the AIChE Annual Meeting in Salt Lake City in November 2010. Entrants were challenged to predict the mutual solubility in liquid-liquid equilibria of water and a glycol ether (PROGLYDE DMM TM) as a function of temperature. 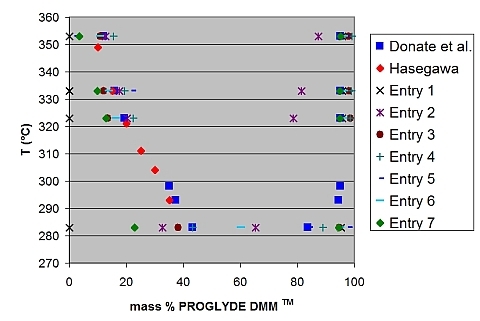 Unlike most organic solvents, glycol ethers and glycol diethers exhibit an “inverse solubility” relationship with water. They are used in a wide range of product formulations and industrial processes. For example, they are used as solvents and co-solvents in both organic- and water-based formulations for applications such as cleaning solutions, paints, coatings, and inks. A variety of other novel applications have been proposed that take advantage of the inverse solubility behavior.